Patchwork Quilt 'Transparency' Tutorial ~ DIY Tutorial Ideas! 1. 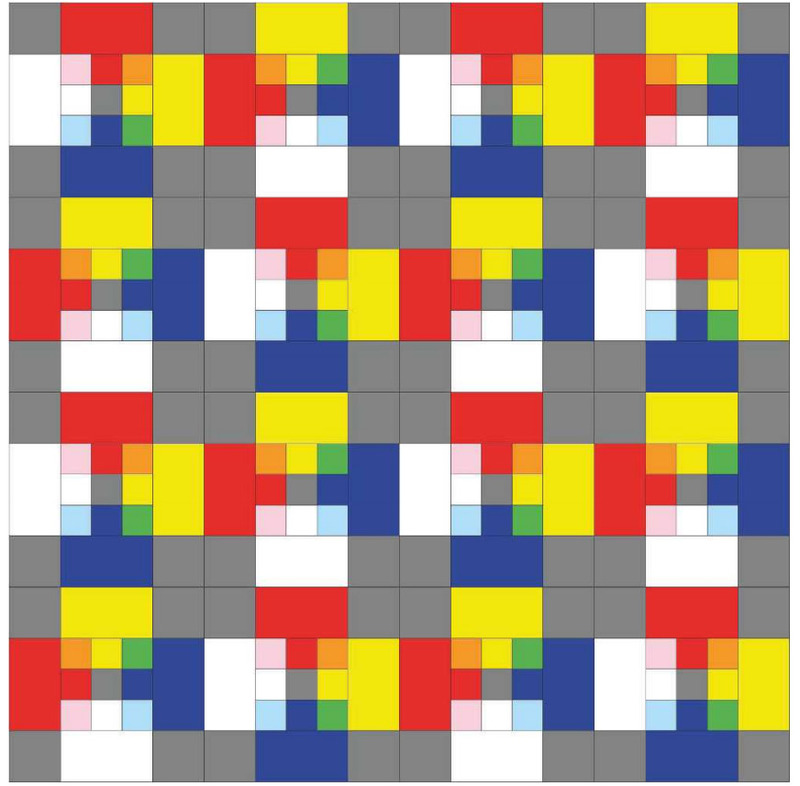 From the grey solid, cut sixty-four 5 1/2in squares and sixteen 3 1/2in squares. 2. From the red solid cut sixteen 9 1/2 x 5 1/2in rectangles and sixteen 3 1/2in squares. 3. From the dark blue solid cut sixteen 9 1/2 x 5 1/2in rectangles and sixteen 3 1/2in squares. 4. From the white solid cut sixteen 9 1/2 x 5 1/2in rectangles and sixteen 3 1/2in squares. 5. From the yellow solid cut sixteen 9 1/2 x 5 1/2in rectangles and sixteen 3 1/2in squares. 6. From the pink print fabric, cut sixteen 3 1/2in squares. 7. From the light blue print fabric cut sixteen 3 1/2in squares. 8. From the green print fabric cut sixteen 3 1/2in squares. 9. From the orange print fabric cut sixteen 3 1/2in squares. 10. From the binding fabric cut eight strips 2 1/2in x width of fabric. 1. 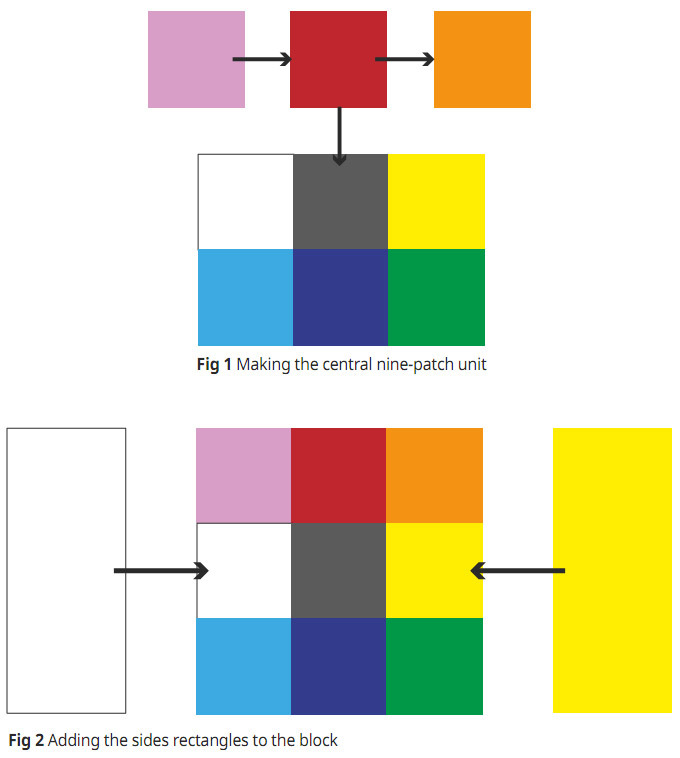 The centre of the block is a simple nine-patch unit, made as follows (see Fig 1). Take a 3 1/2in square of pink, red and orange and sew them together into a row and press the seams to the left. Sew a second row with a 3 1/2in square of white, grey and yellow and press the seams to the right. Sew a third row of light blue, dark blue and green and press the seams to the left. Now sew the rows together, matching seams neatly. Press the seams in one direction. 2. Take a white 9 1/2 x 5 1/2in rectangle and sew it to the side of the block with the white square (Fig 2). Repeat on the opposite side with a yellow rectangle and press seams inwards. 3. Sew a grey 5 1/2in square to each side of a red 9 1/2 x 5 1/2in rectangle and press seams outwards. Sew a grey 5 1/2in square to each side of a dark blue 9 1/2 x 5 1/2in rectangle and press seams outwards. 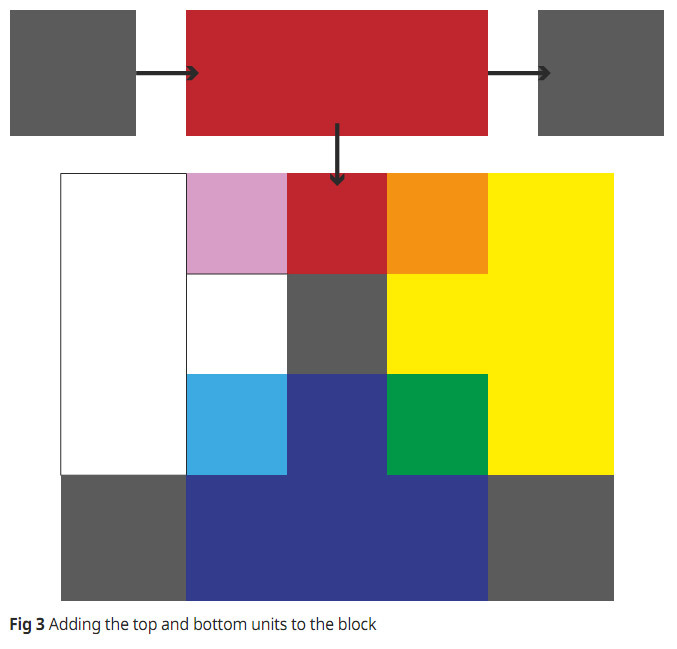 Sew the red/grey unit to the side of the block with the red square, and the blue/grey unit to the remaining side of the block (Fig 3). Press seams to complete the block. Check the block is 19 1/2in square. Make another fifteen blocks in this way. 1. Sew the blocks together in four rows, each with four blocks. 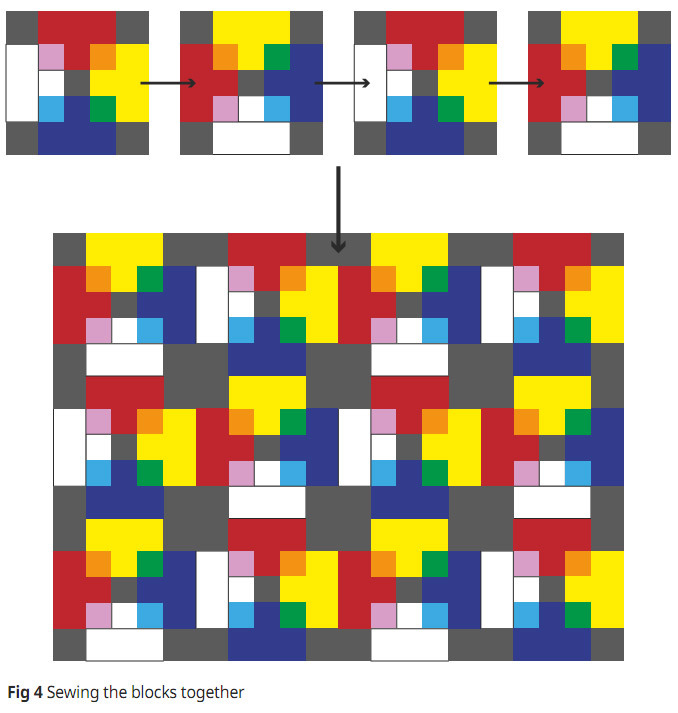 Note that alternate blocks are rotated 90 degrees anti-clockwise, so look carefully at Fig 4 for the correct layout. Press the seams of rows 1 and 3 in the opposite direction to rows 2 and 4. 2. Now sew the rows together, matching seams carefully. Press the long seams all in one direction. Fig 5 shows the finished layout. You may find straight line quilting a lot easier with a walking or dual feed foot. 1. Create a quilt sandwich, with your backing piece right side down, the wadding on top and then the quilt on top, right side up. Use your favourite method to secure the sandwich. 2. Quilt as desired. 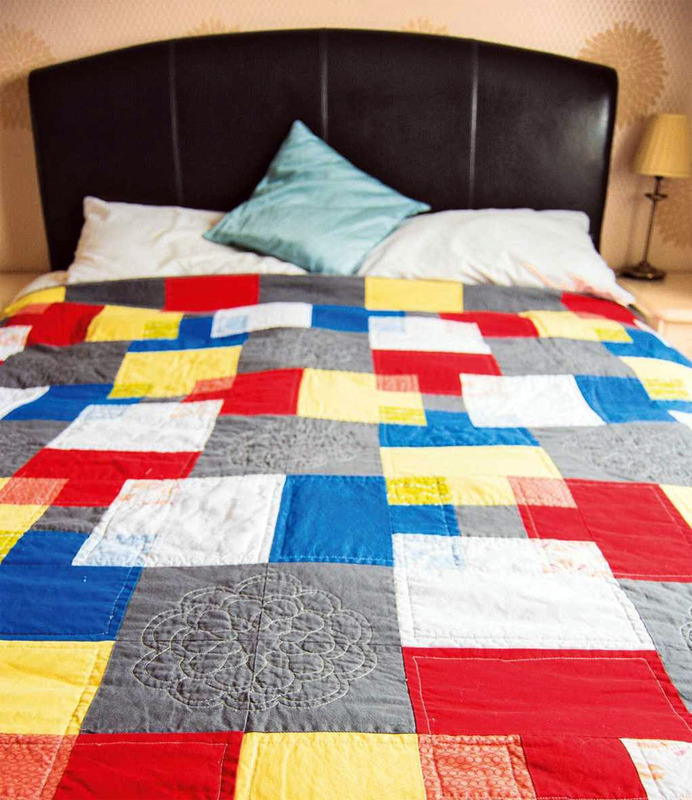 The quilt shown has been machine quilted, with echo quilting within each colour about 1/2in from the seams. 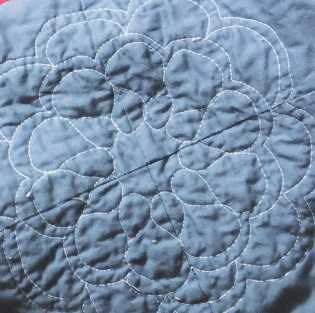 A rosette pattern was also quilted in the grey areas where four blocks meet. You could use a quilting template to create this rosette or a circular feather pattern. There are many quilting templates available in books or to buy – look in your local quilting shop, or search online for ‘quilting templates’. A template less than 10in in diameter will fit the grey area space. 3. When you have finished quilting, secure and tidy all thread ends. Square up the quilt, trimming the wadding, backing to match the quilt top. 4. For the binding, join the eight strips together with 45-degree seams, pressing seams open. Fold the binding in half lengthwise, wrong sides together, and press. Working from the right side and starting part-way down one edge, match the raw edges of the binding to the raw edges of the quilt and sew in place, folding a mitre at each corner. Before completing your stitching, neaten the short raw end of the starting piece and insert the ending piece into it. Fold the binding over to the back of the quilt and neatly slipstitch in place by hand. Add a label, including at least your name, location and the date the quilt was made.